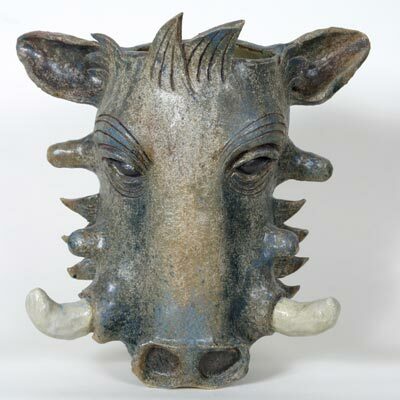 DESCRIPTION Large hand coiled animal head pot with carved features. Pink glaze base rough sprayed to create mottled effect. ARTIST'S STATEMENT This creature has a great comical appeal, which has been enhanced by 'The Lion King's' Pumba character. I have used a subtle range of sprayed on glazes to enrich the surface of this pot.